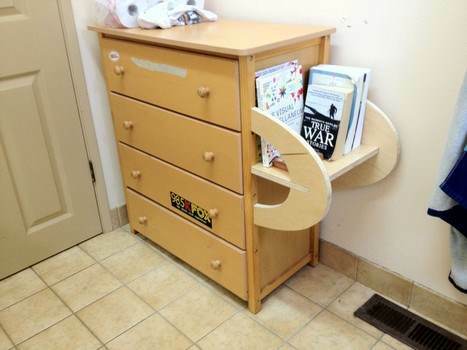 You can never have too much bathroom storage. 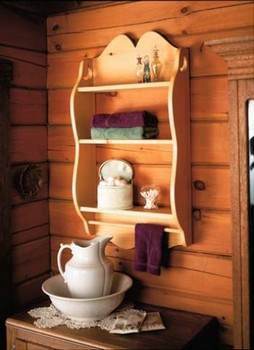 Add storage and style with free bathroom shelf plans. 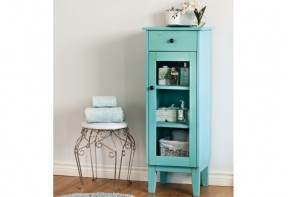 Choose from freestanding shelves, wall mounted cabinets or a complete vanity to add valuable space for towels, toiletries and display. Choose stain or paint to match your existing cabinetry, or use a fun accent color to add a punch of pizzazz for an eclectic look. Select modern, traditional or country styles to match your home decor. 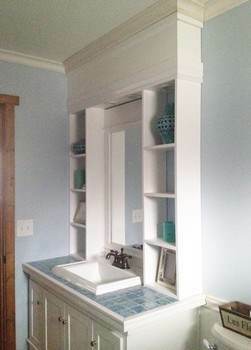 Give your bathroom a quick makeover with a custom cabinet or shelf you build yourself. These projects are great for beginners and can be adapted to fit your space. Spend a weekend and sharpen up your woodworking skills with these fun and functional projects. These plans come with materials lists and building tips, so your project can be completed quickly and easily. Create an attractive box shelf with stylish hooks for your bathroom using this downloadable woodworking plan. This shelf looks good on its own plus offers shelving for displaying towels and other bathroom items. 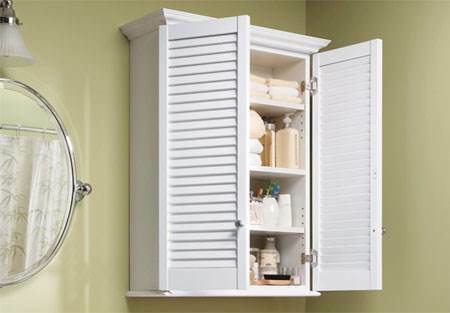 This bathroom storage tower provides two tall shelfs that are great for fitting decorative storage baskets into. 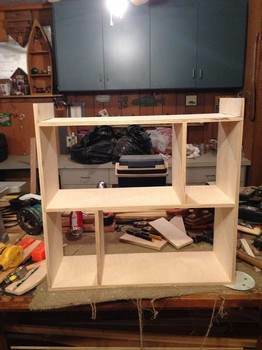 Here are easy to follow plans to help you build a standing shelf unit that will add to your bathrooms decor in more ways than one. 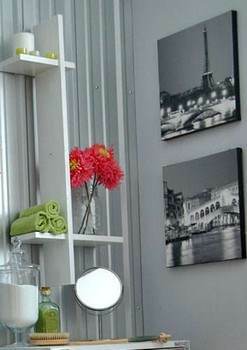 Here is a plan for an artsy wall shelf that is very inexpensive to make. The shelf has sloted inserts and can be easily taken apart then put back together in five different ways. 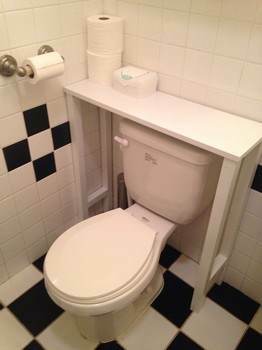 This bathroom shelf unit has three shelves and is designed to be hung on the wall over the toilet. 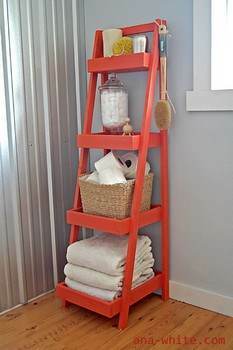 Create a unique and stylish bathroom by building a handsome ladder shelf. 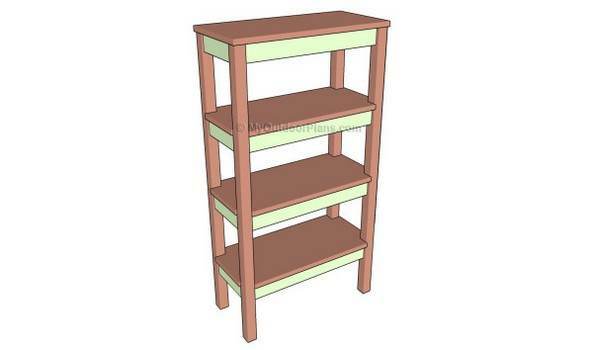 With this plan you can build a ladder shelf as narrow or as wide as needed. 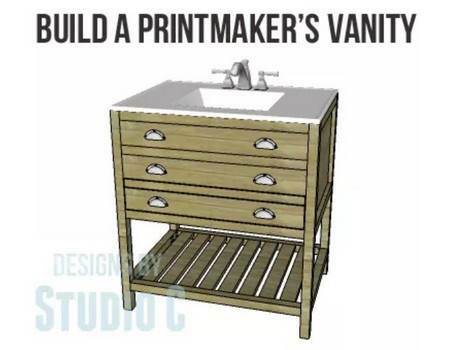 This is a plan for a bathroom vanity with a step drawer built-in. 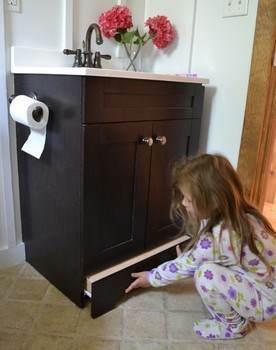 The convienant step drawer is great for kids to stand on while burshing teeth or washing hands, plus it slides easily in and out. 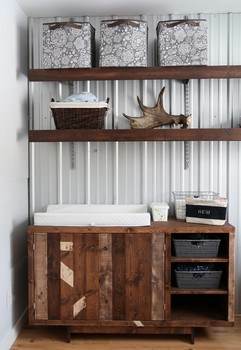 Turn a plain wall into an attractive space by building this lovely storage cabinet with cottage chic styling. 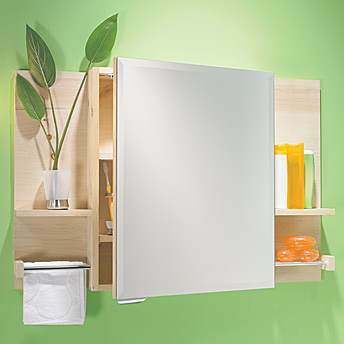 Your bathroom will truly transform once this goodlooking cabinet is hung on the wall. 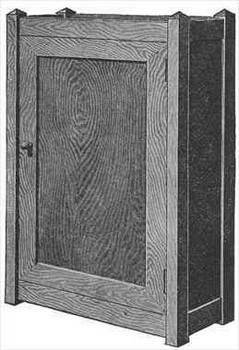 Here is a plan for a bathroom cabinet that has louvre doors. 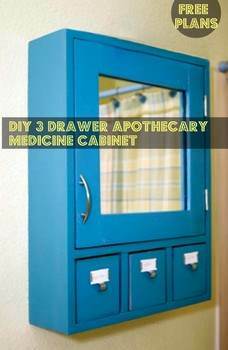 This cabinet provides lots of storage for such things as medicines, toiletries and other miscellaneous. 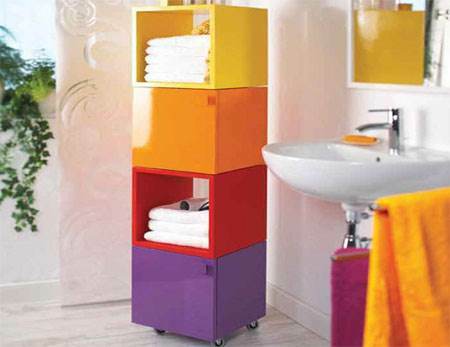 Colorful storage cubes can be stacked and casters placed on the bottom for a storage unit that is ideal for a childs bathroom or a teenagers. This retro style cabinet has a glass door, three shelves, and a drawer at the top. 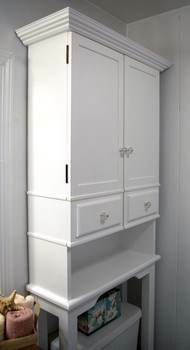 Once built this cabinet works great for adding storage in a small bathroom. 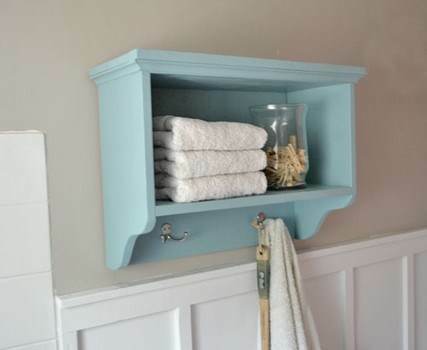 Create a cottage chic styling by building a birdhouse bathroom shelf with attached towel rack using this easy to follow plan with step by step instruction. 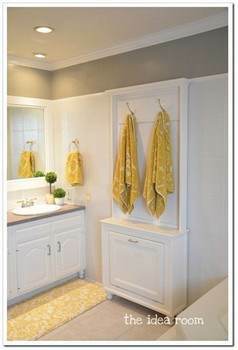 Add charm and storage to any bathroom by building this vanity hutch that runs along each side of the vanity mirror. 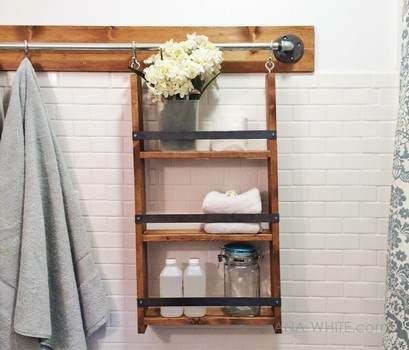 Add storage to a small bathroom with this hanging organizer that can easily hang from a towel bar saving your walls from unsightly nail holes. Build a bathroom vanity with open shelving for placing rolled towels and attractive baskets full of necessities using this woodworking plan. For less than fifty dollars you can create a wall niche that will add style to your bathroom plus give additional storage. 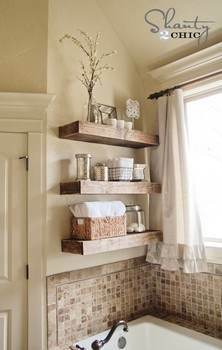 Create additional storage for the bathroom in a single weekend using laminate pine shelving and these step by step instructions. 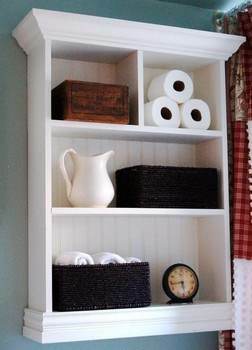 Build standing storage that offers a single double door cabinet, two drawers and one open shelf at the bottom that fits neatly over the bathroom toilet. This cabinet is designed with three side by side square drawers underneath the main cabinet for keeping every-day items such as q-tips, nail clippers and more. An Epilog laser for etching plus a table saw and band saw are used here to make a CNC shelf. 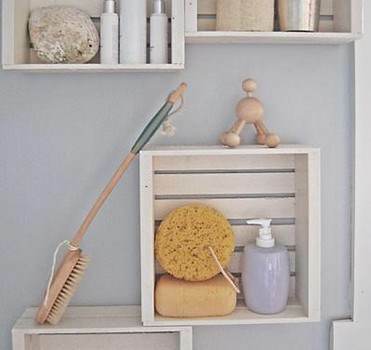 Turn an ordinary blank wall into a thing of beauty by creating floating shelves using this simple shanty chic plan. 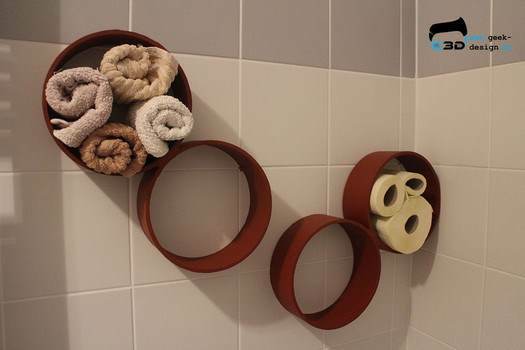 Here are easy to create tubular shelves that work great for storing rolled-up towels for a modern visual effect. 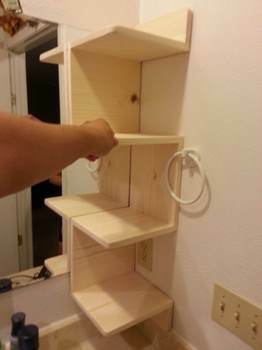 Using just a few materials such as pine board, #10 biscuits and glue you can build this good-looking and inexpensive corner shelf. 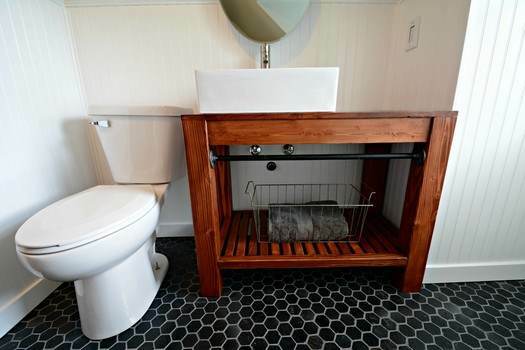 Turn a 30 inch long piece of poplar wood into a strong and sturdy over the toilet shelf with four legs. 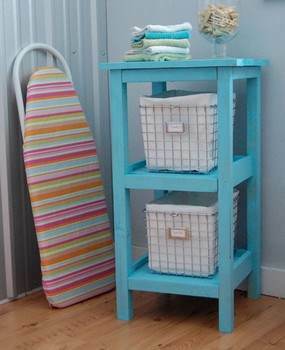 Using a jig saw and miter saw you can turn a used pallet and an old broom stick into a boxed shelf with towel rack. 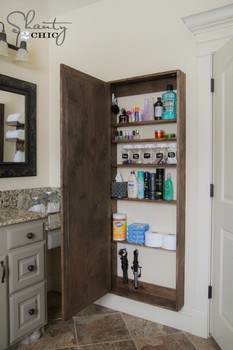 This shelving unit is made using a table saw, miter saw and plywood to create storage in the bathroom. 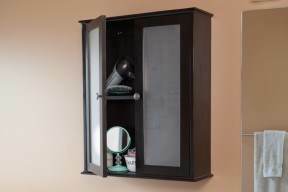 Create a tall wall-mounted cabinet with mirrored door that has several shelves for storing curling irons, hair accessories, dental supplies and more. 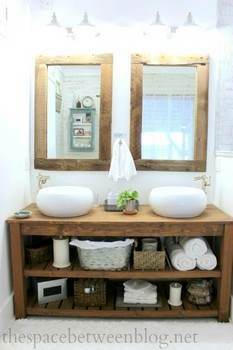 Here are instructions along with diagrams to build a country style bathroom vanity that has ample open storage below the counter. This vanity measures 36 x 24 inches has a single drawer, open back for plumbing and a bottom shelf for storage. 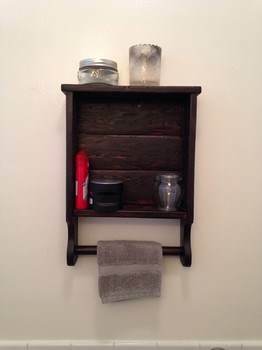 Follow this step by step project for building a set of simple wooden shelves for the bathroom using cedar, redwood or pine. 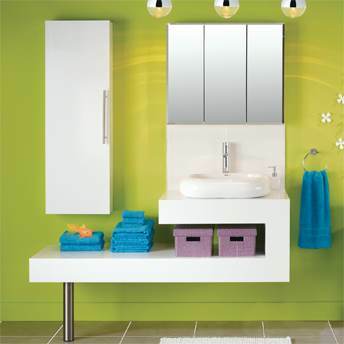 Not only is this piece functional with two towel hooks and a lower cabinet it also will add character to your bathroom. Have pine boards cut to any desired length then turn them into floating shelves for additional storage and visual interest. 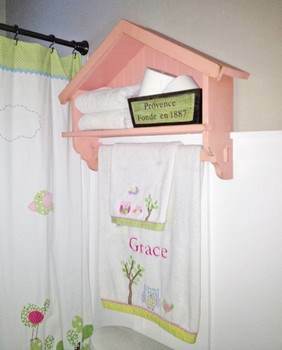 Use scrap wood to make these cute little cubby hole crates that are designed to be mounted on the wall to help keep bath items within hands reach. Create a stylish and sleek bathroom by building this 20 x 60 inch vanity with matching 16 x 48 inch cabinet free of handles and knobs.